Wow. I’ve been a lame blogger lately! You’re probably wondering why I dropped off the planet for blogging there for a while, eh? Well, the last few months have had a lot of ups and downs, in every aspect of my life, and for most of the month of May, I was traveling and not near a computer! One of the many exciting things coming up is the release of my next e-book, How To Communicate Effectively – For Artists & Creatives. I don’t have an official date yet, so stay tuned as for when that will be released! Also, I might be giving a few free copies away to my subscribers, so keep an eye out and you might be able to get this new book for free! Check out the details of this book here. Unfortunately, TWO of my latest attempts at drawing my next pieces in my Threatened & Endangered series were ruined after I’d already drawn part of them. 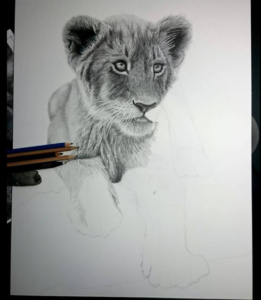 This latest drawing, the Lion Cub, was coming along very nicely…only to be ripped up by a certain unnamed feline studio assistant. So now I have to start it again, starting in a couple weeks when I have a better studio setup. Oh well! I suppose it was good practice, right? 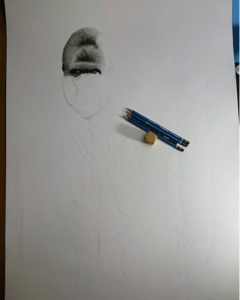 My Western Lowland Gorilla (thankfully) didn’t get as far along before it was ruined. I realized partway through that the paper I was using just wasn’t working for me at this large size, as it kept wrinkling and damaging itself, so I’ve now upgraded and the next one will definitely not have that problem! Almost all of my drawings, large and small, are now being completed on mixed media board instead of drawing paper, which has proved to be my favorite for both graphite, colored pencil, and mixed media pieces. But don’t worry! BOTH will be redone and even better, I promise! I just have to wait a couple weeks to start them again. This series, for those who don’t know, is meant to bring awareness to endangered, threatened, and vulnerable species on our beautiful planet. As an artist, I feel it’s my mission to bring awareness and try to help these animals. This series gives a spotlight on some of them. This series is a little different than my usual artwork. Instead of bright and colorful, I’m trying to gain more emotional attachment by stripping the images of color and having them be black and white, but still with my signature level of detail. I’m leaving the backgrounds white, both to bring awareness to the animals, but also to represent the fact that for most of them, their habitats are disappearing. And I’m also making this series of drawings much larger than my usual pieces, again, to bring more attention to them. Once I have enough completed and framed, I plan to create an exhibit of these pieces and have it travel throughout the state and regions beyond. Each drawing from this series will have some of the proceeds (including from prints sold of it) donated to a conservation organization that helps support that specific species. 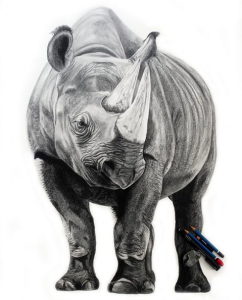 For example, some of the proceeds from the Black Rhino drawing and prints sold of it will be donated to the World Wildlife Fund, which created the first Rhino sanctuary in Kenya. Black Rhino, in graphite and colored pencil. 22×30 inches big. Some of the proceeds from this piece and prints sold of it are being donated to the World Wildlife Fund. 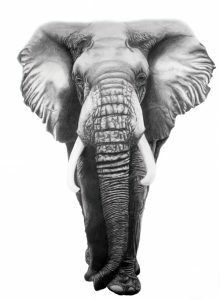 My African Elephant graphite and colored pencil drawing, 22×30 inches big. Some of the proceeds from this piece and prints sold will go to the Wildlife Conservation Society. As always, new exhibits are in the works and being planned for my artwork, so stay tuned! My artwork will come DOWN from the Vermont Institute of Natural Sciences (VINS) down in Quechee, VT on June 1st, so get there before then if you can. I have two pieces on display at the Birds of Vermont Museum in Huntington, VT, ALL summer long! I also have a selection of work up at the Creative Space Gallery in Vergennes, VT, right now for their Our Living Planet exhibit. You’ll love some of the different types of prints I have on display there! The Art Shop in Cambridge, VT continues to stock a nice selection of my work as well, so don’t forget to check them out too, as well as Exile on Main Street, in Barre, VT! 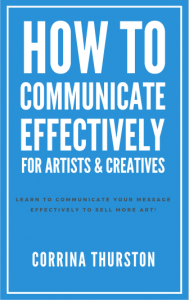 As some of you know, I’ve been bopping around to galleries and non-profits giving speeches lately, and many of them have been about the business side of being an artist, going along the lines of my first book, How To Build Your Art Business: With Limited Time Or Energy, and my second book, How To Communicate Effectively – For Artists & Creatives. The next speech/workshop is scheduled for June 28th at the awesome Milton Artists Guild! 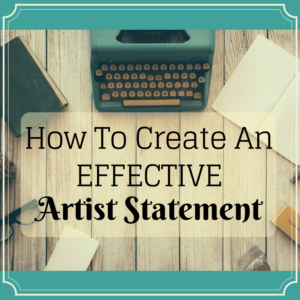 This one will be about How To Create An Effective Artist Statement. Want your artist statement to generate more discussion, acceptance from galleries, and more sales? Come to this workshop to learn how. More speeches and workshops to come after that all summer and fall! Stay tuned!